yeah, yeah. Me and my multiple-part-postings. But I adored my wedding and so I will spend as much time as I want remembering it. :-p Good news for you, though: I decided to do mostly photos and captions, instead of stories. So they will be short reads. It's hard to figure out where to start when I remember the wedding. I'm inclined to think back to the engagement and the planning... but we were engaged for over two years, so that's a lot of ground to cover. Then I think, "maybe I'll start with the dress shopping," but that's mostly boring, as there weren't any "maybe" dresses in my experience. Plus, the day I bought my gown was kinda a fluke... I was at a warehouse in Tampa with my camp friends. So, I guess I'll start with the celebrations... they began about two months before the wedding, with the Bridal Shower (they actually began in November, but I only have one picture from the Engagement Party and it's not very good). 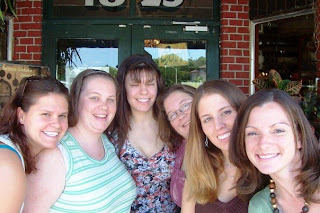 Then, in early April, I had my bachelorette party. We all met up in Orlando on a Friday night to go to Tony and Tina's Wedding in Orlando. It's a dinner show that ran off-Broadway for YEARS. I had a delightful time, and was really, REALLY excited about it. Plus, Tori had let them know we were a bachelorette party, so I got to dance with the groom and stuff. And the bride asked my opinion on what to do about a maid-of-honor situation, and it was a lot of fun. From there, we played some games in the suite we had across the street, then headed into Old Town for a bit of dancing. 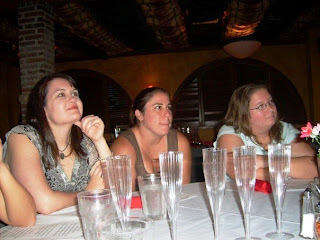 Caroline, Ashley, and Megan watching the show. 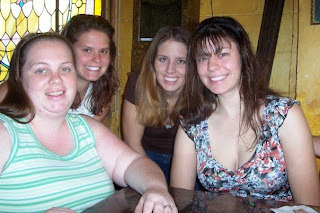 The next day I did my Bridesmaid Luncheon at the White Wolf Cafe in Orlando. 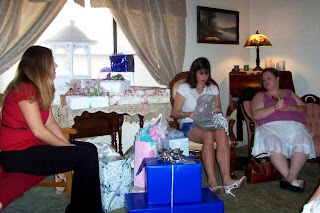 It was a nice place, and everyone enjoyed their gifts.